that's right, the Kingdom of Bojon is stoked for our upcoming hawiian-style bash this saturday, june 19 at broadway studios in san francisco. roll out the hawiian shirts and hula skirts 'cause we've dialed up a glorious playground complete with jammin' reggae, tasty mai tais, killer surf footage, and POSITIVE VIBRATION, YEAH!!! doors will open at 8pm and stay open 'til 2am. arrive early to beat the line and take advantage of the EARLY BIRD SPECIAL - 2 FOR 1 MAI TAIS ('til 10pm). the opening band, Justi-Fi, comes on at 9:30, offering up a high energy combination of reggae, hip-hop and old-school funk all rolled into one. Pacific Vibrations then takes the stage after 11 to throw down an original blend of upbeat ska rhythms and classic reggae roots, set off by an eclectic dosage of horns. 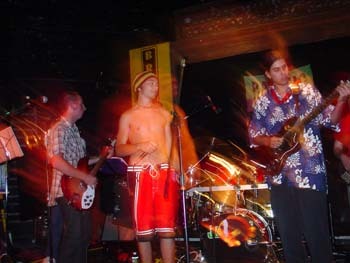 this self-styled reggae/ska/roots/surf/jam band brings strong energy to the equation and will be a real treat. RSVP for this shindig to get on the list and knock $5 off the cover. the deadline to RSVP is this thursday. tix will also be available at the door the night of the show.